This project aims to collaboratively create an Ultra-Affordable Robot (an order of magnitude less expensive than existing products) to inspire young people around the world. In the 2013 Design Challenge, our goal is to create incentives for designers to select any of the winning designs from 2012 and work on enhancements in one or more of 3 categories: 1) hardware 2) software, or 3) curriculum. 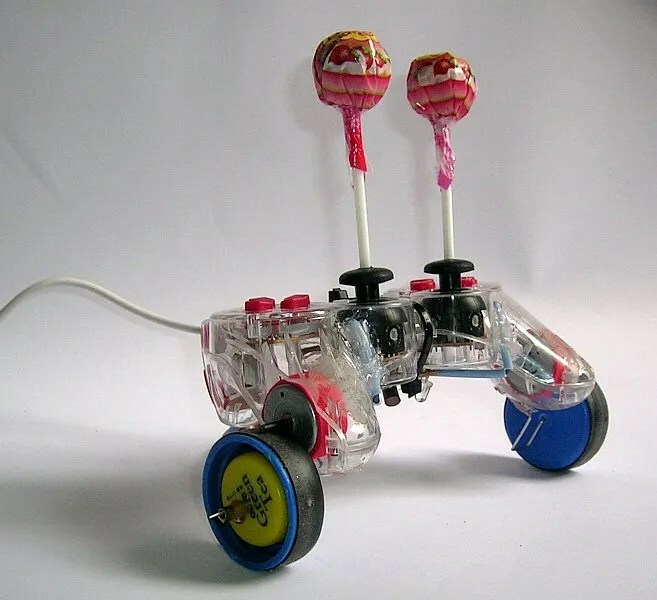 create exciting lesson plans using the Lollybot. There is also a special “community challenge” for participants who organize a robotics workshop for students using one of the winning designs, with or without enhancements. Propose design enhancements to make the robot you choose more effective, robust, re-usable, and even easier to assemble or manufacture than before. Develop open-source software further to add functionality to your chosen robot. More importantly, make it easy for high school learners with no prior programming experience to learn how to program new behaviors for the robot. Outline 20+ hours of educational activity using the robot you chose. Keep in mind that at least 15 hours of the curriculum should be re-usable – it should be aimed at using an already-assembled robot. This ensures that learning continues after the robot is assembled for the first time. You can assume a basic age-appropriate science and math background, with no prior background in robotics or programming experience or even using tools such as a soldering iron. The lessons should help students learn what they need to know. Build one of the winning designs in collaboration with students (primary, secondary or early college), documenting the process and the learning experience for the students. Each category has a grand prize of $500, and a runner-up prize of $250 and a single entry can win in more than one category. “Honorable mentions” will be made for other creative designs. For more details about things like Eligibility, What to submit, and how, Criteria click through to the AFRON website and check out the 2013 Design Challenge. The African Robotics Network (AFRON) is a community of institutions, organizations and individuals engaged in robotics in Africa. AFRON seeks to promote communication and collaborations that will enhance robotics-related education, research, and industry on the continent. Since it launched May 2012, AFRON has 380 regular and affiliated members from 51 countries around the world.